In Noida’s sector-8, a Bajrangdal worker was shot dead at the behest of gamble heavyweights. Acting on the incident, SSP suspended Jhundpura police station in-charge Vijendra Kumar was suspended in the case. 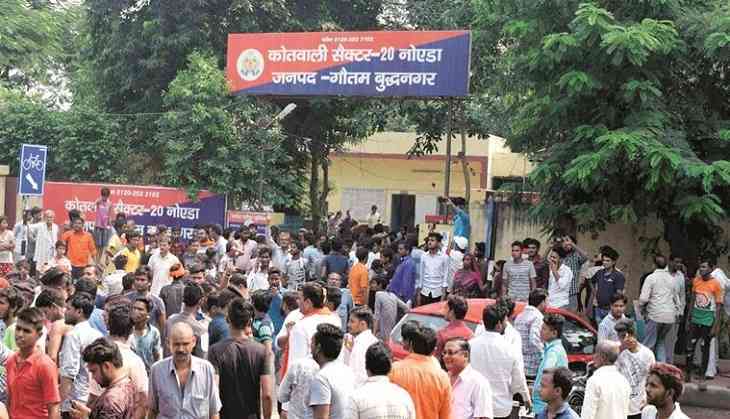 After his death, a mob hurled stones at police and administrative officials on Friday evening to block the funeral procession of a Bajrang Dal worker Ajay Chauhan. SP City Sudha Singh said “Lathi charge was used to disperse the mob and we are registering an FIR against 100-150 unknown persons for violence”. 25-year-old Chauhan allegedly was shot dead for opposing gambling in Noida Sector 8 at around 9.30 pm on Thursday. The police registered an FIR against six persons and arrested three persons but Jeetu Yadav. At the same night, a group of around 50, including members of various right-wing organizations assembled to demand action. BJP Mayur Vihar youth leader Sanjeev Bhati said “The Sector 8 area, where the incident took place, is a hub of illegal activities like gambling and illicit liquor trade. Ajay protested against it and even went to the police to complain. He had gone to stop people who were gambling and because of this, they killed him”. However, his father and brother said that they don’t know about the work he did as a Bajrang Dal activist. His father Pramod Kumar said “He worked during the day at a clothing store in Faridabad”. Talking about the rightwing protest against his murder, SP Singh said “We spent around four hours trying to placate the gathering. The City Magistrate and I met a delegation of around seven people, including family members. The chowki in-charge has been suspended for not being able to suppress illegal activities in the area”.